Pics: John Kritzman Full set of photos for DAY 1 HERE, and for DAY 2 HERE! Click on the pics to enlarge them! B.O.M.B. Fest kicked off this past Memorial Day weekend with its third annual festival containing several national and local artists from across the music spectrum. Moved from its original location at Western Connecticut State University to Hartford’s Comcast Theatre, B.O.M.B. 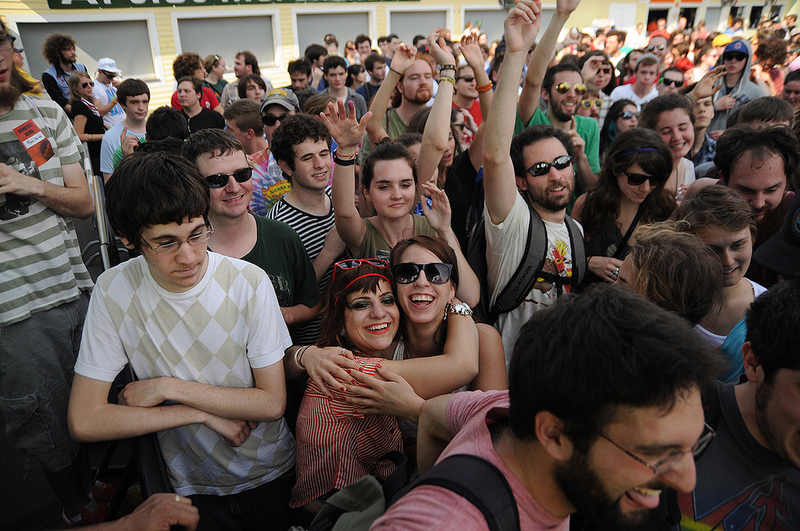 Fest, standing for Bring Our Music Back, introduced a two day event first created by Frank Bombaci Jr. in 2009. In addition to bringing both small and large bands to a common ground with equal audiences, 70% all the show's proceeds goes to charities. "I started B.O.M.B. Fest when I was a senior in high school," Bombaci explained, "Our high school makes us do a senior project, so I thought it would be cool to put on a music festival. Six weeks before our scheduled date, we finally got our stuff together and pulled through with eighteen bands and six touring acts. The Cool Kids and Say Anything headlined, and it was a lot smaller than it is this year, but we had 1200 people, so it was a positive, small first festival. So we said you know what? Let’s give it a go." B.O.M.B. Fest has truly grown, with this year’s lineup featuring over 40 national acts and more than 25 local artists, including big names such as Weezer and Snoop Dogg. 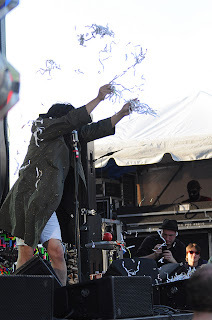 Unfortunately, a few acts backed out of the festival late in the game, with Wiz Kalifa stuck in Chicago due to inclement weather and a member of the Dum Dum Girls experiencing a death in the family. One of the first bands to start the event over at the Budweiser stage was Distoria, a Queens-based group exploding with the catchy sounds of melodic pop rock. Soon after the group began performing, the sun finally broke through the gloomy overcast and engulfed the positive atmosphere surrounding the non-profit festival. 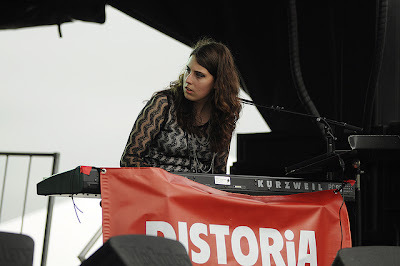 Pianist and front woman, Helena Martin, whom grew up in Connecticut, shared her passion for music and the event. "I’ve been involved in B.O.M.B. festivals for three years now. I’ve played every year and I’ve been the local talent coordinator for two years," told Ms. Martin, "The reason I love playing at B.O.M.B. Fest is because it gives an opportunity for local artists like myself to play on a huge stage, to rub shoulders with some really big acts, and just kind of casually. Not only are we invited to play here, we’re welcome to play here and we’re treated equally. In addition to that, B.O.M.B. Fest also donates its profits to places that either promote healing or education through music. It’s really a win-win for everyone." "Live Nation Connecticut has been really helpful," told Bombaci, "The charities are the most important part, we don’t take any money. We’ve had a lot of great sponsors but we don’t take any money back, we give it all to charity: the Hole in the Wall Gang Camp, Lyman Allyn, and YPI, which was an art camp that I went to when I was a kid." Maria Gomez, whom works at the Hole in the Wall Gang Camp, belongs to just one of the organizations benefiting from the proceeds. "It’s a really great organization that brings music to the community but it also funds organizations that have music programming that helps kids go through some healing and express themselves in important ways," explained Ms. Gomez, "We’re glad to be here." It was difficult to catch all of the overlapping performances of the two day fest, but I tried to experience as many small and live bands as possible. 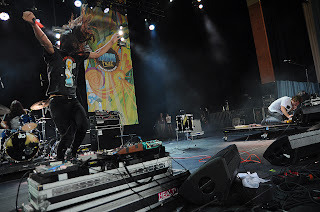 In one of the acts that played early on the first day at the Viva La Bomb stage was Roots of Creation, whom were introduced as being discovered online by Bombaci and invited to play at B.O.M.B. Fest for the past three years in a row. With the crowd moving and grooving to the reggae beats emerging from the five-piece band, smoke billowed across the stage through flashing, multicolored lights. 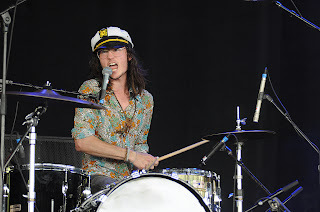 Their smooth, feel-good vibe radiated across the grounds with more and more people attracting to the stage, as lead singer Brett Wilson invited everyone to step forward and fill the gap between crowd and stage. Wilson also expressed his support of the cause and satisfaction of helping others while still putting on an awesome show. "When I was starting out with our band, there wasn’t opportunities like this, to play with a bunch of national bands that are bigger, that you look up to, you can make friends with and establish contacts with," said Wilson, "I think it’s awesome. I’m all about non-profits; we do benefits all the time. As far as music goes, all of the artists that I look up to are trying to make a difference in the world, so we’re just trying to do our part." 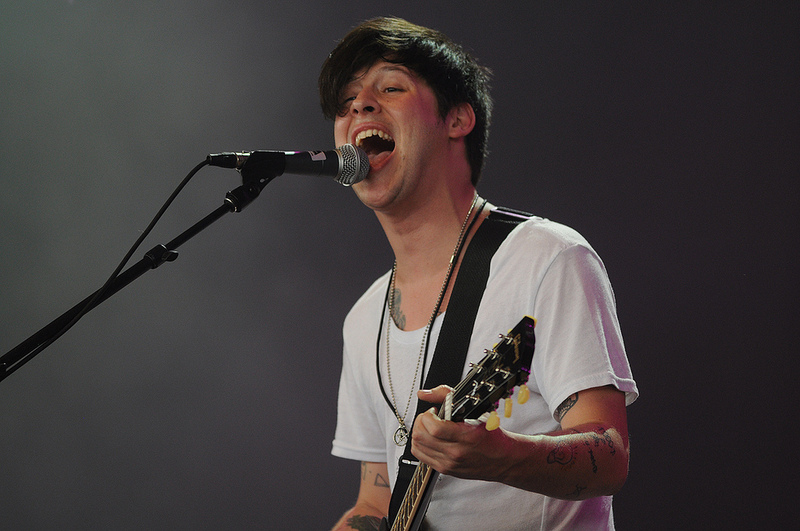 Wavves hit the main stage as a large, young crowd gathered in the pit. The rad, rebelious ambiance of the Californian three-piece band certainly held true to their fun, don’t care, never-gonna-grow up songs full of catchy melodies and noise pop. 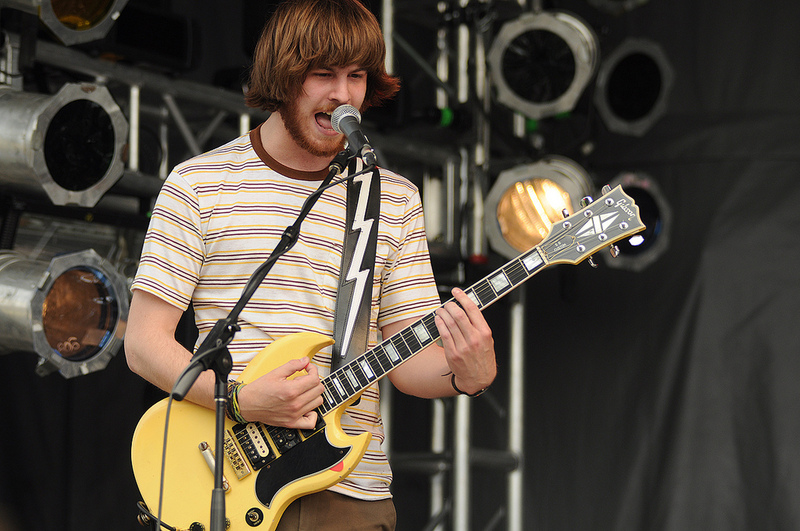 After lead singer and guitarist Nathan Williams publically thanked a group of sixteen-year-olds for getting them high, Wavves went on to play songs such as "King of the Beach" and "No Hope Kids." 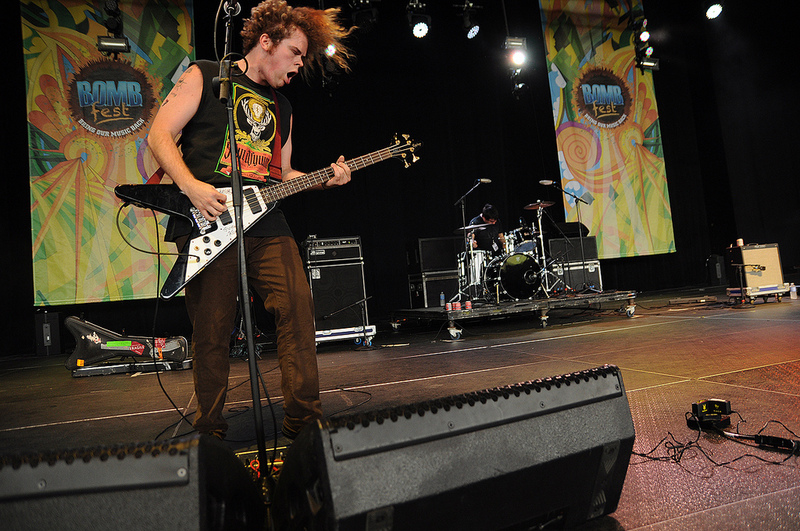 Immediately following Wavves on the main stage was The Guru, an indie, funk rock band from small, surrounding towns in Connecticut. With an array of bandanas swinging from the neck of their bass and the drummer adorning a Capitan’s hat, The Guru has such immense style and personality that bursts through their hip, fetching songs, such as "Taste." Representing one of the local bands of B.O.M.B. Fest, they were happy to show their support for other bands. "B.O.M.B. Fest is unique in that it helps all levels of the music scene," explained bassist Dan George, "There’s national acts like Weezer, that people come to see, and it’ll introduce them to smaller national acts like Wavves or Best Coast, that they might not be as familiar with. 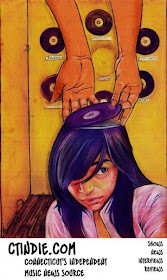 People can get familiar with smaller local artists and then it benefits the kids at the bottom, so they start new bands. It’s a whole top-down thing." The Guru spills a feel-good atmosphere that you can’t help but get down to, which was obvious by the looks of the crowd. 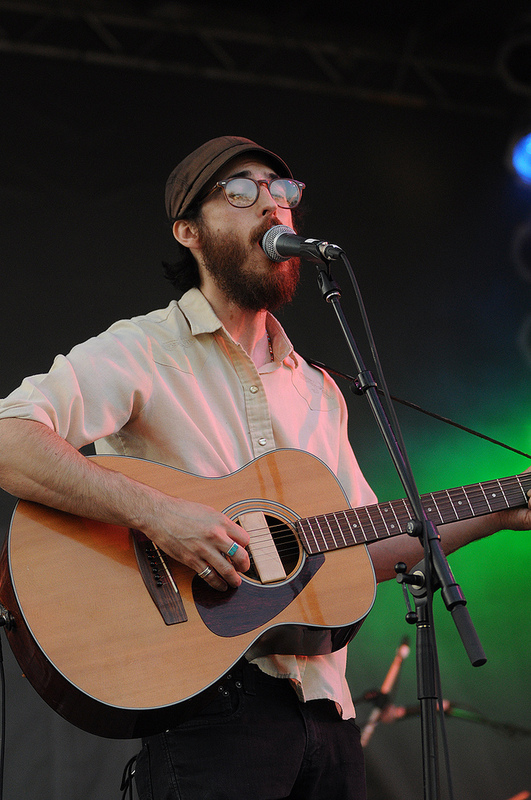 Another act that played the main stage was the indie punk sound of Titus Andronicus. The New Jersey band came with great vigor as lead singer Patrick Stickles sang with fellow guitarist Amy Klein jumping up and down beside him, an endless smile on her face. Toward the end of their set, Titus Andronicus got the crowd waving their arms in their air to the lyrics "I will always be a loser" from their song "No Future Part III: Escape from No Future." 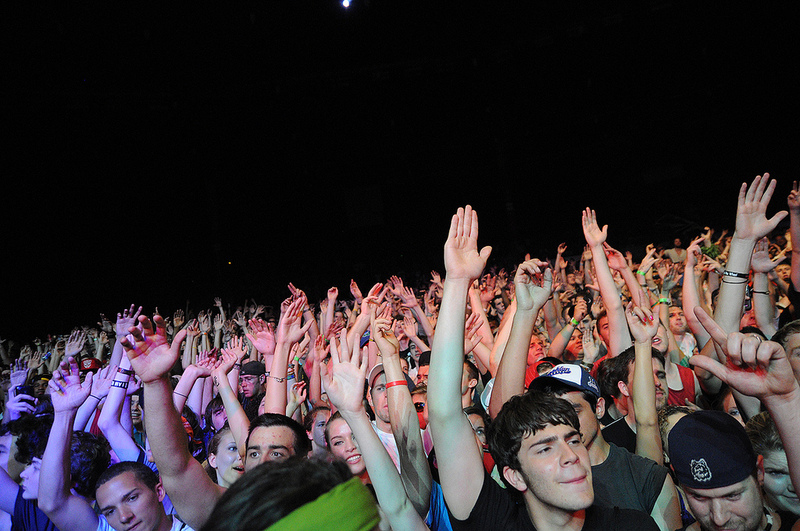 Later, at the Budweiser stage, Dan Deacon truly stole the show in terms of audience participation and crazy energy. 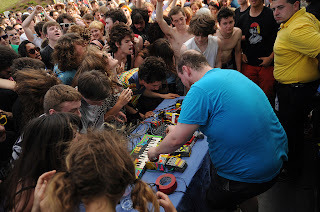 Forming a close contact shell of sweaty hyped-up kids around him at floor level, Dan Deacon busted electronic beats that had everyone at jumping and pushing each other. During his performance, he also had everyone form a circle, in which he gave the a large synopsis of the movie "Big" and gave instructions for individuals in the middle to dance like they were the mother in the film, just finding a grown man in their son’s bed. Once this dance affair was over, everyone ran toward each other to dance in the middle. To end his originally dynamic and spastically hip set, he formed a dancing human tunnel. With two people forming a tower with their hands, someone would go underneath and stand next to them to form the same stance with another person, and repeat all the way from the Budweiser stage, to the top of the stairs, back down the other, and then some. It was truly ridiculous. Dan Deacon really knows how to get a party started, or at least, moving. 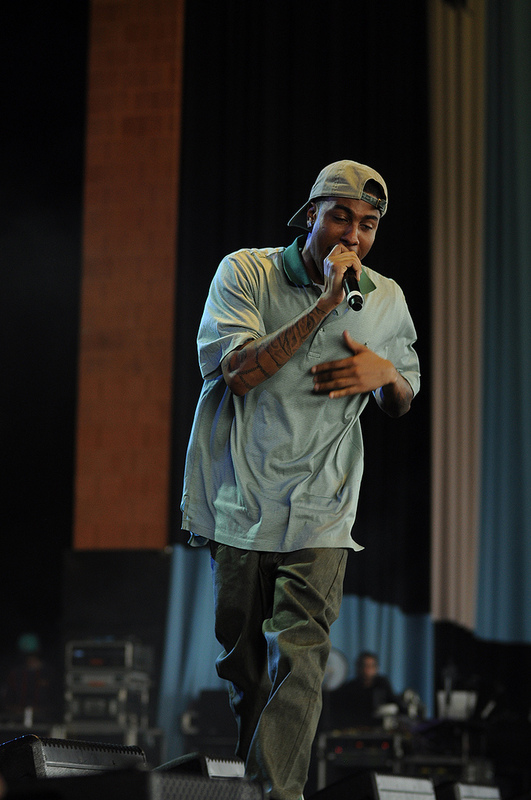 The Cool Kids took to the main stage to bring a hip hop element to B.O.M.B. Fest, in which they bumped the bass so loud I saw a girl in front of me hold her chest and say to her friend, "I can’t breathe." HEALTH delivered an eerie set full of raw synth, screeching guitar, and heavy drum hits. 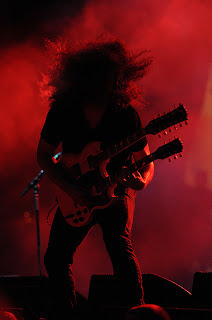 Playing songs such as "We Are Water," and "Die Slow," bassist/noisemaker John Famiglietti swung his long, black hair gracefully through the air and swayed while hitting a drum in the center of the stage. I thought their performance was something beautiful. 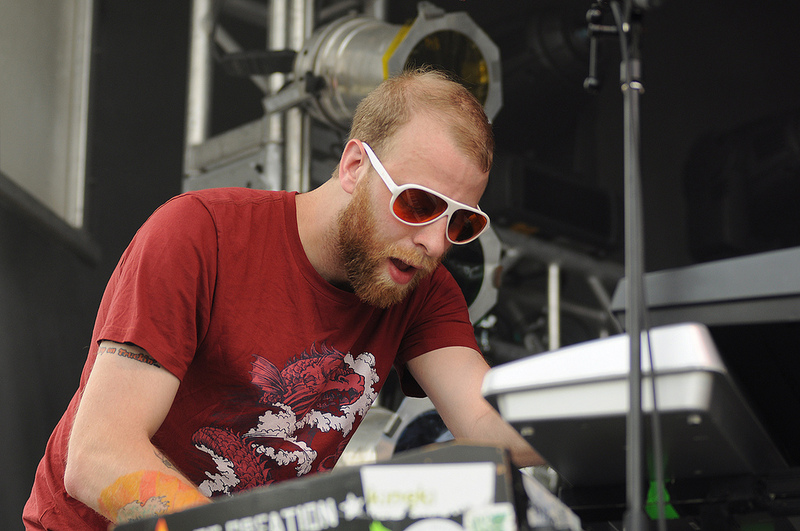 Other bands to perform were the lo-fi folk rock sounds of Woods, which were introduced by Dan Deacon. "We went to college together but I never really see those guys very often so that was really fun," commented Deacon. 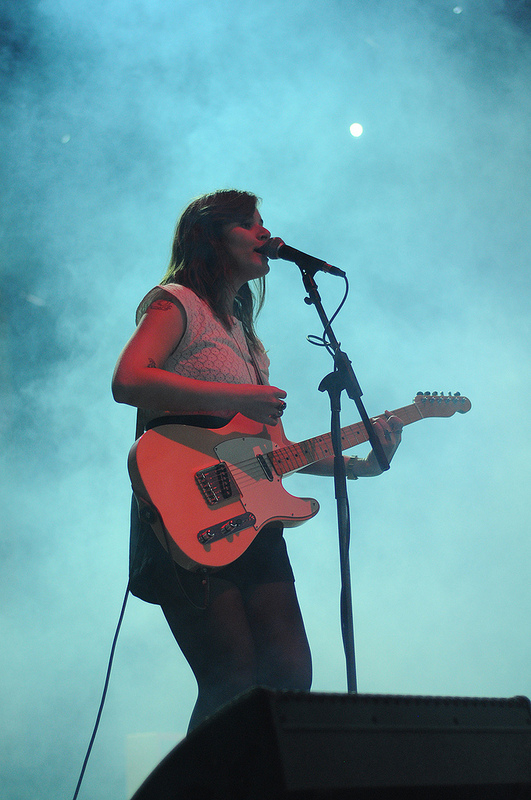 Best Coast also performed on the main stage, opening with the dreamy vocals and fuzzy styling of their song "Bratty B." The indie, surf pop three piece also went on to perform songs such as "Crazy for You" and "When I’m With You." Front woman Bethany Cosentino closed the set by dedicating their last song to her dad and cat, Snacks, back in California. Edward Sharpe and the Magnetic Zeros gave a beautiful performance with their large group casting a warm, cozy atmosphere through indie folk and alternative country pop ballads. Finishing out their set with a longer, dramatic rendition of their single "Home," the band had the whole crowd singing along with them, which had then grown quite large. Weezer. Most to all of the goers of the festival gathered in the pit, lounged in seats, and sprawled out across lawn of the pavilion. As Weezer’s giant glowing logo of a jazzed-up "W" illuminated behind them, the band played an even mixture of songs from across their albums such as "El Scorcho" from Pinkerton all the way to "Pork and Beans" from the Red Album. Fans replicated the logo with their hands and rocked them high toward the stage as singer Rivers Cumo delivered far more energy than I thought he could. In an encore performance, Weezer returned and impressively killed a cover of Radiohead’s "Paranoid Android." They finished out with their popular hit "Buddy Holly," which sent everyone going nuts. Chalk Talk, an energetic surf band from Massachusetts, was one of the first acts to open the second day of the festival, and showed a positive outlook on B.OM.B. Fest for the CT music scene. "B.O.M.B. 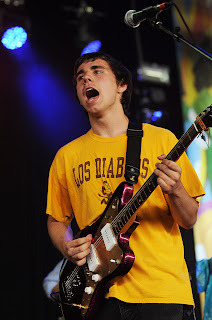 Fest is really cool because it really gives local small bands that have no connections at all a real chance to play a real stage with legitimate bands," explained Bryce, guitarist in Chalk Talk, "It’s great, especially for Connecticut, because there’s a ton of bands in Connecticut, a lot of active bands. It’s really good to have something bigger for them to branch out outside of the halls, and from like the normal ten friends that come out." Mark Nussbaum Talks BOMB Fest, from Manic Productions (his booking and promotional project) has played a huge part in promoting B.O.M.B. Fest. "I think that any time an event happens in Connecticut that wouldn’t normally, it makes people look and go 'Oh, that’s in Connecticut?" told Nussbaum, "I think it’s kind of a big deal, it might make other bands look at Connecticut in a different way, maybe they’ll see Connecticut and say 'Oh we should play there.' It’s kind of like when we’re doing our shows, a lot of the bands that we book will skip over Connecticut and do New York and Boston, of course, every time. They always have that day off in between, so when we grab them, now more and more bands are coming here because of that. I think that with an event this big, maybe some other festivals will pop up." 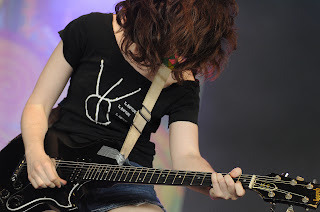 Against Me!, dressed in all black, played an aggressive set on the main stage earlier in the day. 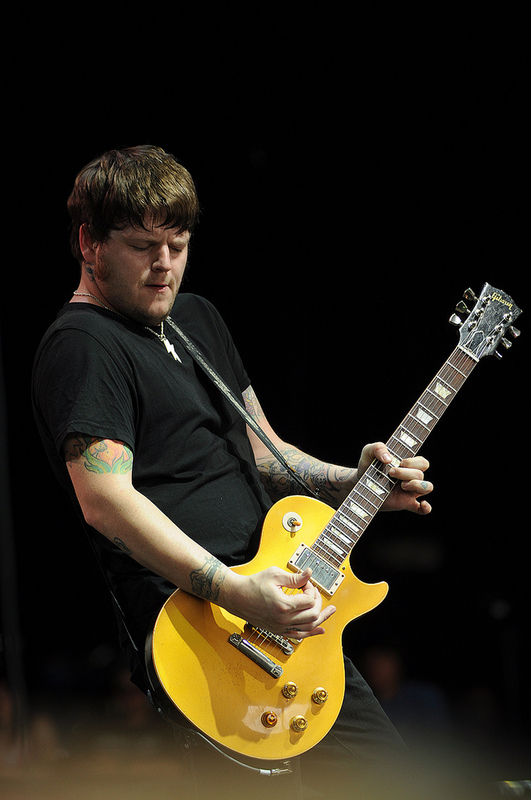 With anarcho-punk songs containing themes such as pro-choice, the band played songs from their album Reinventing Axl Rose through their newest album, White Crosses, as powerfully delivered through the help of front man Tom Gabel’s in-your-face vocals. The angst that emerges through their songs created a pushy mosh pit on the floor, in which one girl later pushed past me covering her bloody nose. 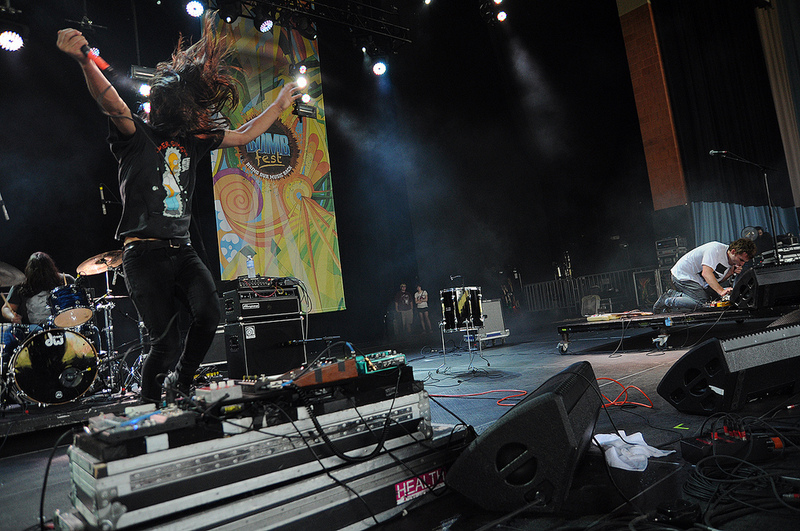 Calming the main stage, State Radio performed with soft, harmonizing vocals and a subtle reggae style. The Massachusetts band played cool, light-hearted songs such as "Doctor Ron the Actor" and "Right Me Up." Budweiser stage brought the bizarre, funhouse appeal of Man Man, as front man Ryan Kattner, aka Honus Honus, climbed over neon accented instruments while wearing white face paint. 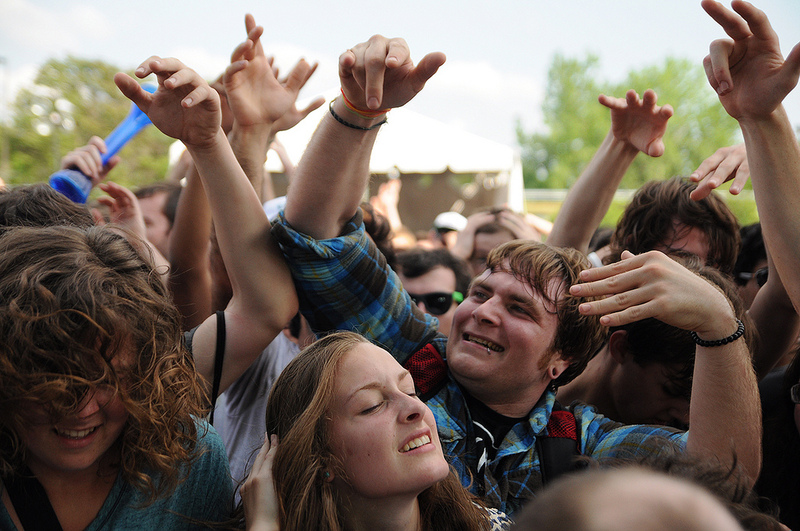 12th Planet later brought hard hitting dubstep to the Fest which sent goers over the top. People were moshing, grinding, jumping, break dancing, punching and going wild to the masterings of Los Angeles' own John Dadzie, whom has been called American Dubstep King. To close out B.O.M.B. 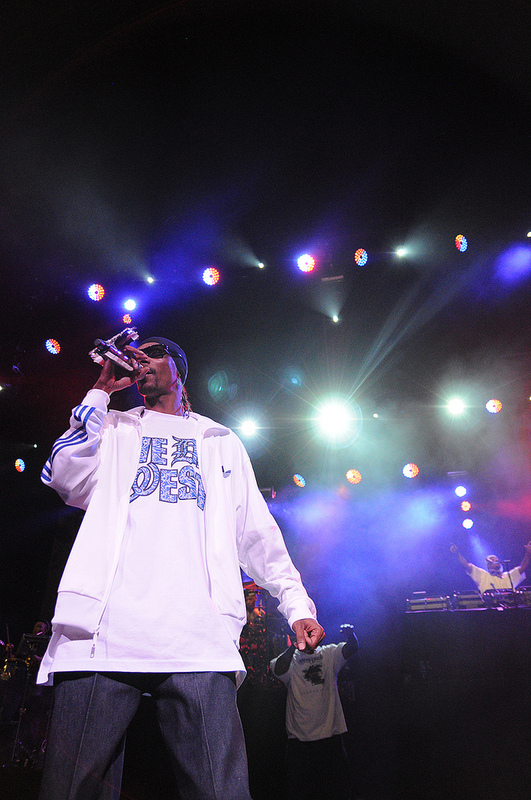 Fest, people quickly packed into the main pavilion and anxiously awaited for Snoop Dogg’s delayed performance. As the crew set up a DJ station, a drum set, amps, and other equipment, I knew this performance was going to be ridiculous. After a long wait, two body guards cornered themselves on either side of the stage. His sound mixer, smoking a blunt, hyped up the crowd by repeatedly asking if we were ready for Snoop Dogg. Finally, the man himself emerged with three scantily-clad backup dancers. Snoop Dogg gripped a diamond plated microphone as he glided across the stage with total swag. The crowd was completely going crazy, screaming lyrics, and throwing their hands in the air as he rapped "What’s My Name," "Gin and Juice," "Drop it Like it’s Hot," and other classics and new hits. 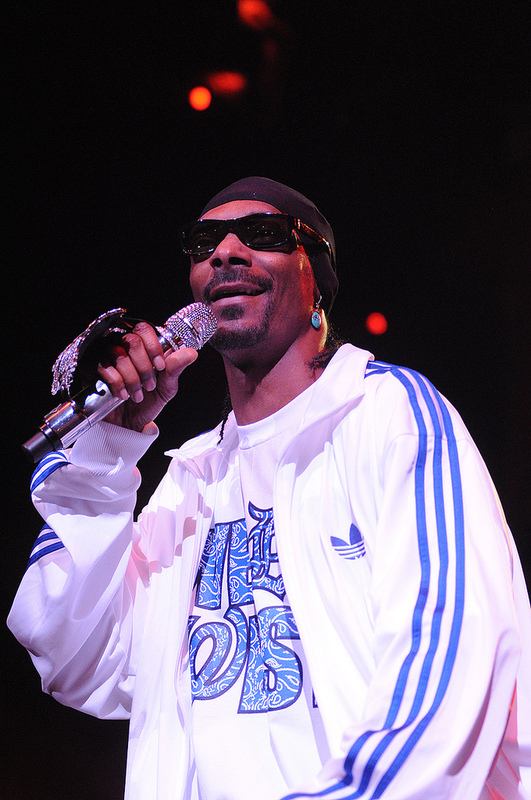 Snoop Dogg even paid homage to Nate Dogg, Tupac, and Biggie Smalls by mastering the deceased rappers' songs and asking everyone to pay their respects. Snoop put so much life and entertainment into his set such as holding a screaming match between the "East" and "West" sides of the crowd and holding his mic toward the audience for lyrical participation. I couldn’t believe how much marijuana Snoop and his crew were smoking on stage, even taking a smoke break in the middle of his set. I still don’t know how they got away with it. I guess laws don't apply when your name is Snoop Dogg. Overall, B.O.M.B. Fest held two beautiful days of impressive acts from across the music scene. The excitement and gratitude from everyone who took part in the event was strong and the chatter of the next fest is already rising. It proved to be a very successful experience for all. "I just want to thank everyone for supporting us," said Bombaci, "I want to let people know that we want to grow. Without the support, we can’t grow. 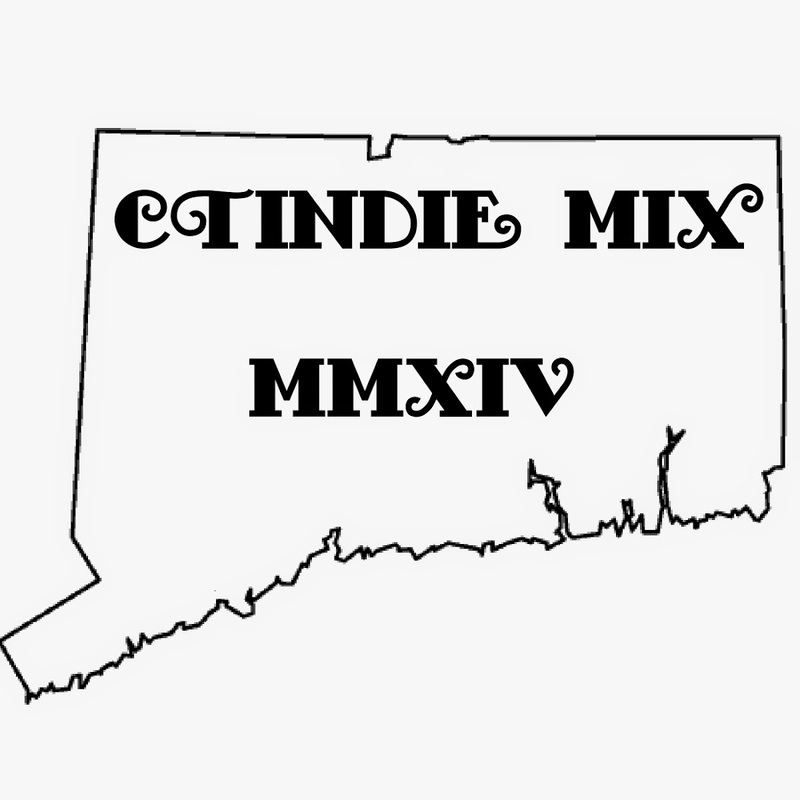 We have big ideas for the future; we want people to keep supporting not only us, but also those charities and local music in Connecticut." Kritzman's photos are always so great.